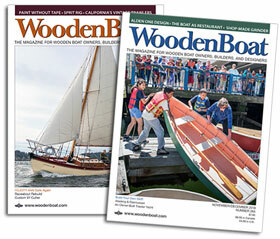 This 16′ Lowell Amesbury Skiff, built for WoodenBoat magazine’s Sept/Oct. 2014 Issue, is in excellent condition. She was launched in 2016 and has Cedar planking, locust frames/rails/stem, mahogany transom. It includes, 2016 30-hp Tohatsu motor, trailer, captain’s steering wheel, white cedar floor decks, bronze cleats, automatic bilge pump, and anchor. Currently stored inside in Orleans, MA. $13,500.